When you have a hardwood floor that needs to be refinished, you don’t want to take any chances when it comes to hiring a professional to do the job. Hardwood flooring can keep its beauty and strength for a long time, as long as it is properly cared for. At Lawalt Home Improvement we have the training, experience, and knowledge necessary to provide you with top-notch service, and we guarantee our work 100%. Our process for refinishing starts with preparation, which includes sanding and buffing. This creates a lot of dust, so we’ll cover any furniture in the area and close off any rooms that aren’t being treated. You’ll also need to be either out of the home during this time or in a part of the home that will be sealed off. The next step of the process we’ll be applying a polyurethane finishing coat, and most of the time it will be the water-based type. This type has advantages because it is non-toxic, and it dries quickly so we can apply several coats in one day. There are no harmful fumes which means that you, your children, and your pets will be safe. If you decide that you’d like your floor to have a different color shade, we’ll be glad to provide staining for you as well. We’ll be sure that you get the exact color you’re looking for. We complete the entire process as quickly as possible, and we pay attention to detail during every step. Call us today to schedule an appointment and to get a free cost estimate. There are few things that look more beautiful in homes than hardwood floors; they add warmth and elegance to any room, and they go well with almost any kind of decor. 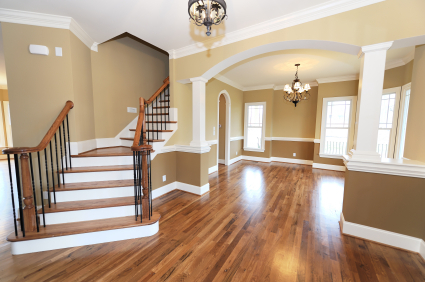 At Lawalt Home Improvement we specialize in hardwood flooring, and whether you need new installation, repair, or refinishing, you can count on us to do the job right. We have the experience and the expertise to provide you with exactly what you need, and we guarantee our products and our work 100%.